Army arrests wanted Kaduna bandit, kidnapper – Royal Times of Nigeria. 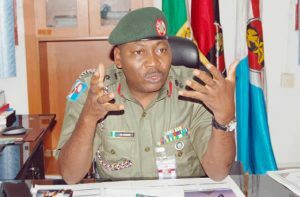 The Nigerian Army has confirmed the arrest of a notorious and wanted leader, Sani Ibrahim, aka ‘Burtu’ by troops from the 1 Division in Kaduna State, Premium Times reports. Burtu was apprehended along the Kaduna-Abuja road on Wednesday. Brig. -Gen. Sani Usman, Director of Army Public Relations, who confirmed the arrest in a statement on Thursday said the suspect was picked up when the troops cordoned armed bandits’ camp at Rijana forest. Usman said Ibrahim has been on the wanted list of the security agencies in Kaduna State for a while. He said one motorcycle and 25 goats were recovered from the camp.